Crayola wax crayons, gouache, india ink. Made in the autumn of 1959 while living in Paris. Sky Scrolls are the first works Lijn made in a series. They were influenced by her interest in Chinese horizontal scrolls and her love and fascination with the sky. 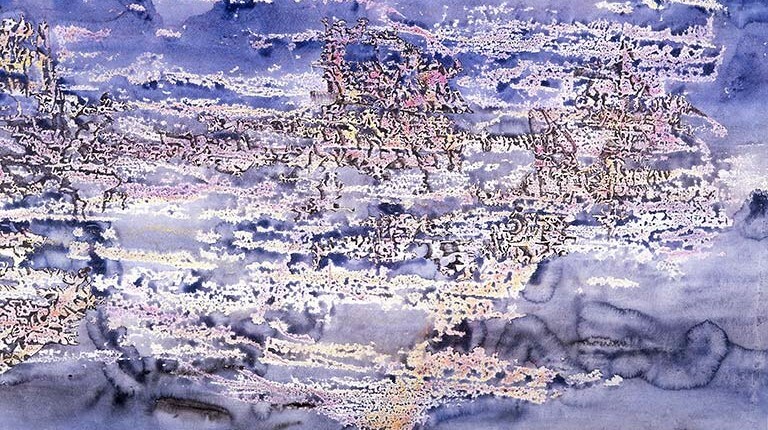 The ancient silk scrolls depict vast landscapes in which humans and their habitations are compressed to a cosmic scale, whereas my scrolls are drawings of transmogrified cloud worlds and flying creatures of the imagination. A selection of these works was exhibited at the Louis Alexander Gallery, New York, 1961, which was owned by Paul Cummings, who in the 1970’s started the Drawing Journal and also the drawing collection at the Whitney Museum as Adjunct Curator for Drawings. Cummings interviewed Lijn in 1972 for the Archives of American Art at the Smithsonian.